Diving Frontiers was established in 1993 and is one of the leading scuba diving stores in Perth, WA. Originally developed to promote scuba diving education at an affordable cost, with the emphasis on the fun of diving, whilst maintaining high training standards. Over the last 25 years, the business has built up a large team of professional and experienced Instructors and Staff, who all share the passion of diving. Today, we still offer some of the most affordable scuba diving courses from beginner, through to Divemaster and all the way up to Instructor. The Shop has a fantastic selection of very competitively priced dive equipment, from quality brands such as Mares, Cressi and Oceanic, along with one of the best selections of Spearfishing and Freediving equipment in Perth. We have a large service department, using cutting edge ultrasonic cleaning machines and genuine servicing parts, with all servicing carried out by fully trained Technicians. All our servicing work comes with a guarantee. We also have an approved Hydrostatic Test Station on site, as well as an Enriched Air Nitrox Membrane. The shop has achieved the rating of SSI Instructor Training Centre, one of the highest professional level ratings in the Industry and is also the only Mares/SSI Pro Dealer in Perth. Previously, the shop has been recognised as the Oceanic Dealer of the Year for “Western Australia” in 2003, 2004, 2005, 2006, 2010, 2011, 2012 and 2013. Few dive shops in Perth can boast such an impressive and consistent record. We also won the prestigious Oceanic Dealer of the Year award for “Australia” in 2007, 2008 and 2009. Listed below are some of Diving Frontiers long term staff. Our shop has the most experienced Diving Instructors in Perth. They have certified thousands of divers, but still have a real passion for teaching and ensuring students have an enjoyable time. We are very fortunate to have such a fantastic and experienced Team. Darren Beadle – Owner / Manager / Instructor – Darren has been diving for almost 20 years in many parts of Australia including WA, Queensland, New South Wales, Victoria and South Australia. He has also experienced diving in the UK, Vanuatu and Fiji. Qualified as an SSI and PADI Instructor in December 2002, he has worked for a number of different dive operations in Perth. Darren joined the team at Diving Frontiers in 2004 and worked closely with Diving Frontiers founder, Glenn Bailey, before eventually taking over the reigns as Owner in 2017. 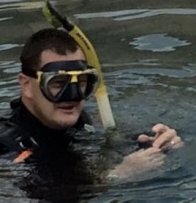 Simon Humphreys – Shop Manager / SSI Instructor Trainer / Service Technician – Simon has worked overseas for several years, at several busy diving organisations, gaining a significant amount of experience. He is a vital member of our experienced team. Prior to returning home to Perth, Simon was Trip Director on Spirit of Freedom, a 5 Star liveaboard vessel, based in Cairns, running trips to the Northern Ribbon Reefs and Osprey Reef, in the Coral Sea. He has also worked on the Sunshine Coast, Hamilton Island and the Mackerel Islands. Like everyone at Diving Frontiers, Simon is passionate about diving and the marine environment. Chris Dodd - Senior SSI and PADI Dive Instructor and Rebreather Instructor – Chris loves diving and his passion for the sport is infectious. He is a dedicated Instructor for whom nothing is too much trouble. He is also an advocate for conservation and is a strong supporter of the Sea Shepherd Conservation Society. He loves showing others the wonder of the underwater world. Hannah Donnelly - SSI Instructor - Hannah has grown up in the water and was the first graduate of our Instructor Training Centre. She is obsessed with sharks and coral, is a Bachelor in Marine Science and is a big advocate for conservation. Her fun loving, bubbly personality endears her to all her students. During her Instructor Examination, she received a special commendation from her Instructor Examiner, who said that Hannah's performance and marks during the IE were some of the best he had ever observed! Hannah loves her diving and her passion for the sport rubs off on everyone she teaches. Grace Chesky - SSI Instructor - Grace's love for diving began in 2012 on Australia's East Coast. She loved the colourful corals, the abundant fish life and the fact that diving allowed her to explore an amazing new world. She describes diving as meditation and enjoys the peaceful quietness her diving brings to this otherwise hectic and fast paced world. As with many of our Instructor's, Grace loves sharing her passion for diving and enjoys giving others the opportunity to experience this adventure for themselves. 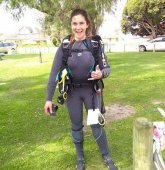 She studied Marine Science, currently works at AQWA and lists Rottnest Island, Mindarie and Centaur reef as some of her top dives. Grace says nothing beats that peace you experience whilst underwater and there's no better place to learn to dive than right here, along WA's fantastic coastline! Helaina Wright - SSI and PADI Instructor - Helaina has been diving since she was in primary school. She is always excited to dive, loves sharing her knowledge and passion for diving and loves all the marine life she gets to hang out with. Along with diving, Helaina's other passion is her martial arts. She has competed in many kickboxing tournaments, won State and National Jiu Jitsu titles and also doubles as our shop security! She may always be smiling and laughing but don't be fooled, she has all the skills and discipline to ensure you have a fantastic time on your dive journey, from Scuba Diver, all the way through to Dive Pro. Helaina's most memorable dive is Castle Rock in Komodo, but despite all the places she's dived Rottnest Island still has a special place in her heart, with many great memories from local sites such as the Opera house, Crystal Palace and Roe Reef. Dario Carpenito - Freediving Instructor - Dario's deepest dive to date is a 44m Freedive and his longest breath hold is 5 minutes 30 seconds. He has experienced Freediving in Italy, Indonesia, Sri Lanka and Australia and was taught by French multi-record holder Yoram Zekri. He has trained in Sardinia with the legendary Umberto Pelizzari and some of the best Apnea Instructors in Italy. Dario says he loves Freediving because "when I'm underwater I feel safe, protected and it's my refuge". Carmen Reidy – Part-time Instructor (PADI and SSI) – Carmen has been a Dive Instructor since 2012. She worked full time out of Hamilton Island, then moved to Cairns and worked on the world renowned liveaboard vessel, Spirit of Freedom. She also worked a season on the Ningaloo Reef in 2015, on a liveaboard called "Shore Thing". Carmen says the best part about diving is always finding, or seeing something new. You just never know when you're going to see something you haven’t seen before! Her most memorable dive was a Night dive on a remote underwater pinnacle in 50 metres, in the Coral sea.